Fall is in the air! It actually felt a little cooler the past few evenings. (or the candy corn has gotten to our heads!) The kids are back in school, the snow birds are planning their decent to the south and we are continuing to create for the Holidays. We have some great gift ideas again this year as well some old favorites renewed. Wait till you see the new fabrics from Andover. The vintage kitchen look of "Early Bird" is so cute! Just can't wait to get a few samples made. If only there were about 8 hours more a day available. Monday, Sept 20th Margy will be teaching Beginner Fusible Applique. This class, Pumpkin Vine, will show you the basics of the fusible applique process. Check out our web page for details. On Tuesday, Sept 28 Joey will host a Pumpkin Farm gathering. 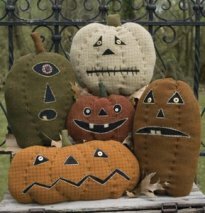 These appliqued and stuffed fellows will sure to make you smile. Joey has re-done the pattern in cotton fabric and will share her information in class. Wednesday, Sept 29th The first of our "Beach Walk" sessions begins. If you are constructing this wonderful quilt or individual blocks we are here to help. Attend any of the "Beach Walk" sessions for just $10, or FREE when you purchase the kits here. Did you know there is a local quilt show? The House of Refuge, 301 SE MacArthur Blvd in Stuart, is hosting a display of quilts from the Martin County Quilt Guild. 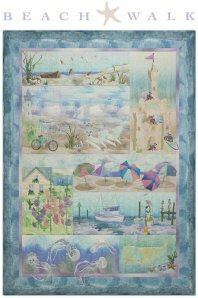 The quilts can be viewed on Tuesdays, Thursdays and Saturdays September 21st through October 2nd, 1 - 4pm. Please make an effort to view these great accomplishments and support the House of Refuge. A note to our Civil Warriors- I miscut the fabrics that did not work in Block 10. The 12 1/2" block only took an hour to complete! UGGGG! Relax and enjoy the process and think of all we are learning. See you next month. Thimbleberries Club will be meeting on Friday and Saturday from 10am to 2pm. Look forward to seeing you there. Back to School SALE. All books are 40% off (excluding new 2010 publications.) Our shelves are full and we need your help to find the bottom of the piles. The holiday fabrics (excludes 2010 fabrics) in our Sample room are now $5.50 per yard through Saturday, September 25th (wow, three months until Christmas.) A great buy for backs and bags you need to finish up! Red and Purple fabrics continue at $5.00 per yard through Saturday. Remember- no points awarded or redeemed on sale merchandise. There are no batiks included in the sale. One yard minimum cuts required. All sales are final. See ya soon!!!! Remember Saturday until the first Saturday in October, we close at 2pm.